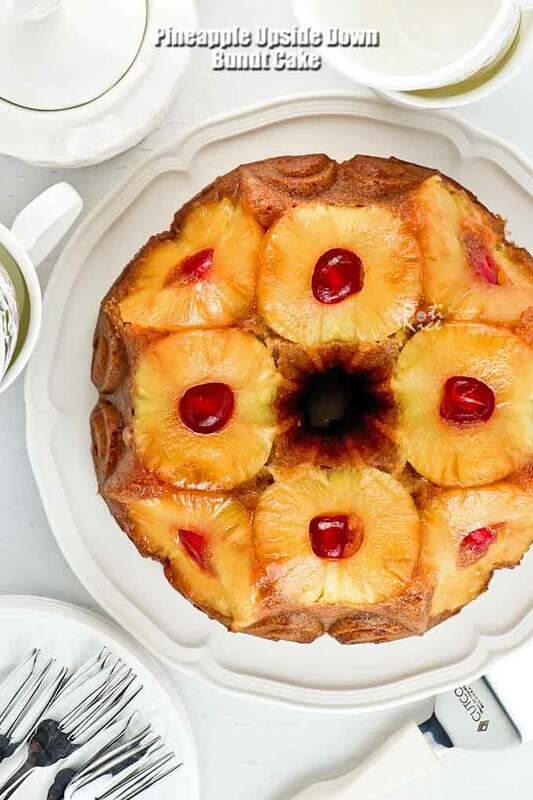 This beautiful Pineapple Upside Down Bundt Cake is a feast for the eyes and the palate. It is fragrant, moist, and perfect for any occasion. Today is a special day, not only because it is New Year’s Eve but also the blog anniversary of Roti n Rice. Eight years ago today, I wrote this post. Hard to believe I have been sharing recipes all these years. It’s been quite a journey! 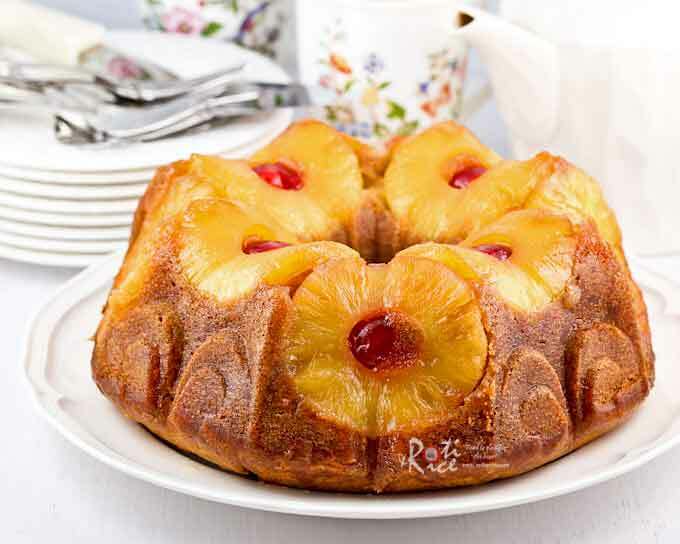 To celebrate, I made this Pineapple Upside Down Bundt Cake for afternoon tea using my brand new Nordic Ware Fleur De Lis Bundt Pan which made the cake look quite beautiful. I was able to arrange some of the pineapple slices at the side of the pan which was really nice. The pattern held the pineapple slices in place and they stayed on after I inverted the cake. I actually made two of these cakes. One was for our Christmas Party on Wednesday. That one turned out to be a little smaller and so I adjusted the recipe for a fuller cake this time. I have to say I am very happy with the way the cake turned out. Sift all-purpose flour, baking powder, baking soda, and salt into a large bowl. Preheat the oven to 350°F (180°C). Spray a 9 inch (10 cups/2.4 liters) bundt pan. 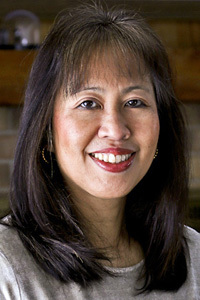 Pour melted butter into the pan and sprinkle ¼ cup (45g) brown sugar evenly over the butter. 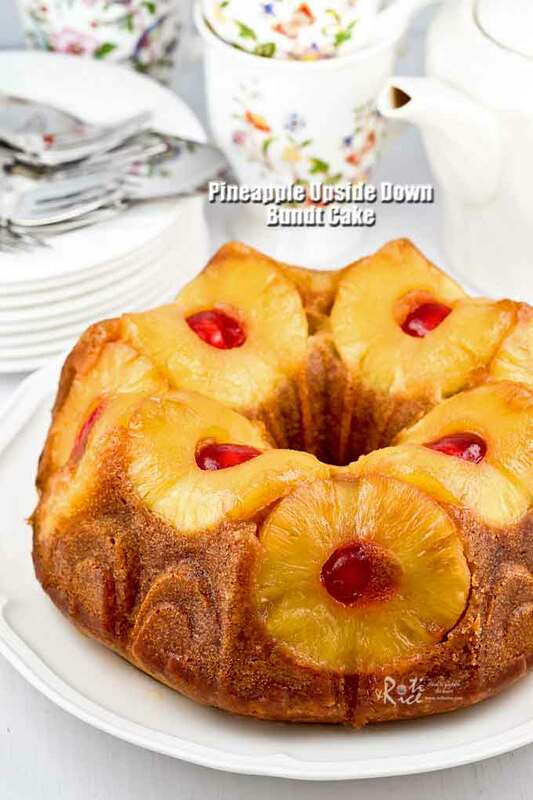 Line bottom and sides of the pan with pineapple slices. 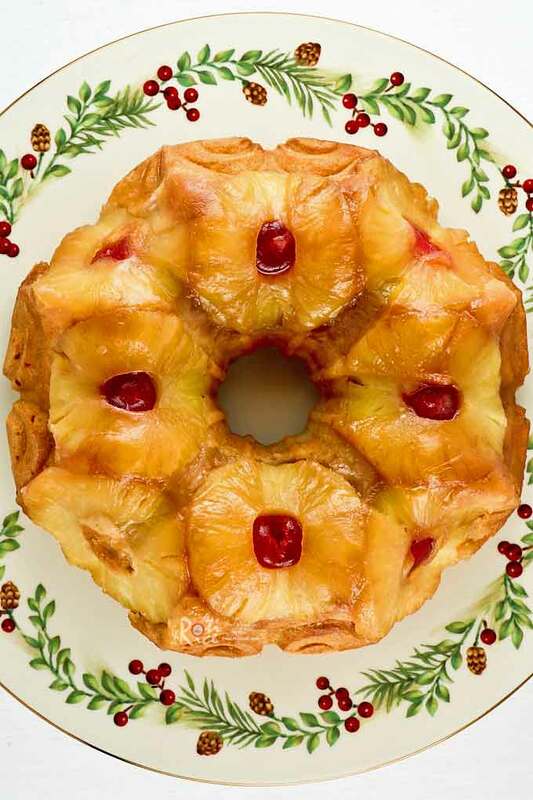 Place a glazed cherry in the middle of each pineapple slice. In a large bowl, beat the butter and remaining ¾ cup (135g) brown sugar until smooth, about 2 minutes. Beat in the eggs followed by plain yogurt and vanilla extract. Add half the flour mixture and half of the milk. Beat on low speed. Then add remaining flour mixture and milk. Continue to beat until combine. 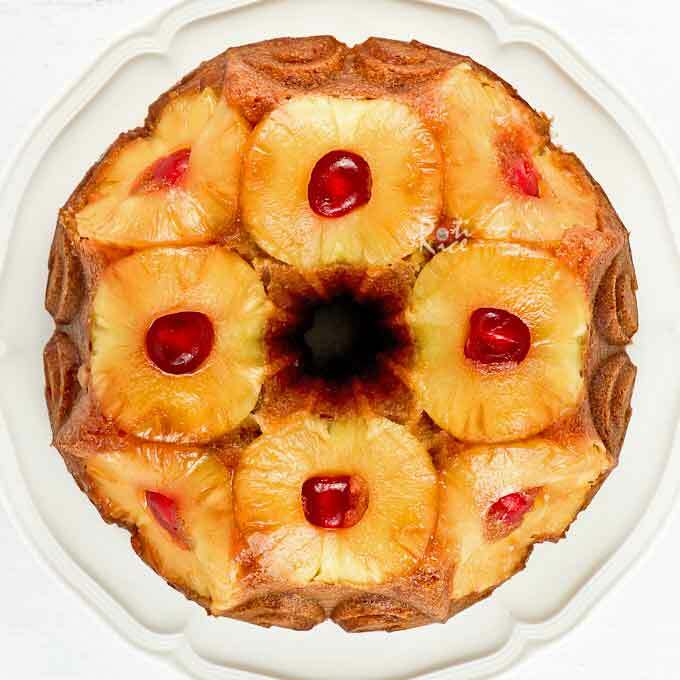 Pour batter into Bundt pan over the pineapple slices and cherries. Place in the preheated oven and bake for 55 to 60 minutes or until a pick inserted into the thickest part comes out clean. Allow cake to cool in pan for 5 minutes. Then invert cake onto a plate. 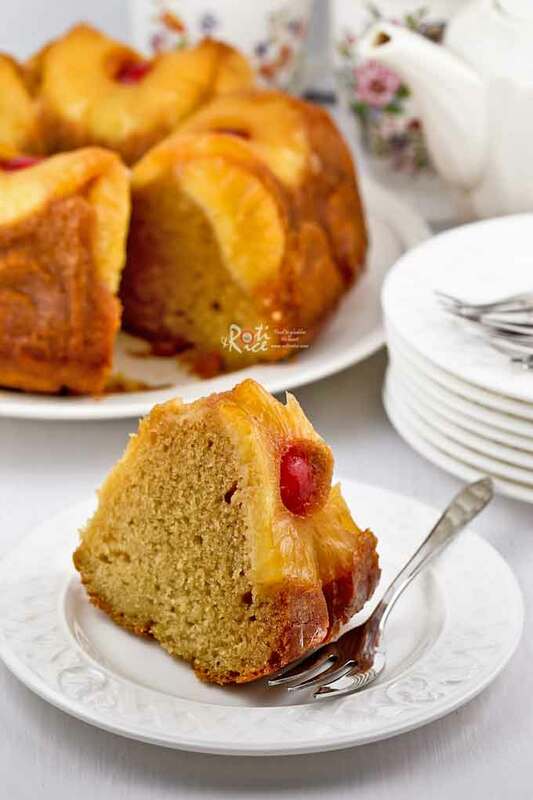 This Pineapple Upside Down Bundt Cake is quite moist and has a very even texture. 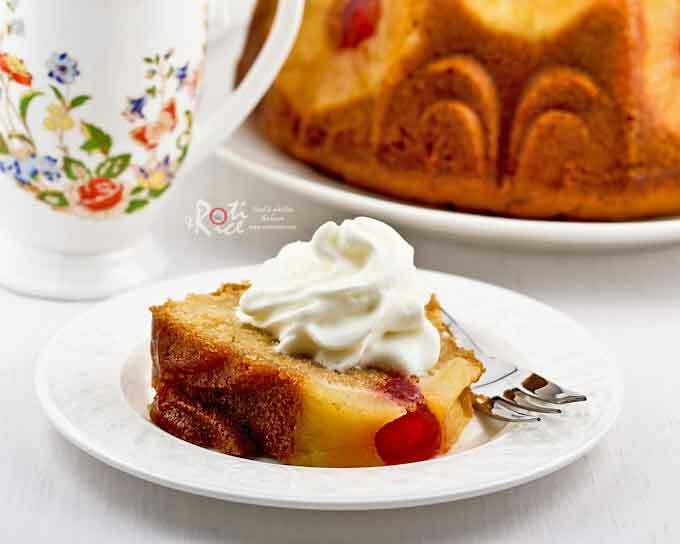 It is especially delicious served warm with whipped cream. This is my final post for 2017. Here is wishing you a very HAPPY NEW YEAR! May 2018 bring you much joy, success, and good health!